In a few months, I need to finish the third book in a contemporary romantic action series. (Another Phil Hafeldt Adventure.) Two glitches came up and have kept me stalled. One is tied to the previous confession of spending too much time in the past and not enough time in the present. An integral aspect of the next Phil book is the search for an artifact that begins in the Bermuda Triangle area and moves to the Western Pacific. Problems and conflicts revolve around Phil’s phobia’s—enclosed spaces, anything underwater and getting trapped in either, lying guys, her fiancé’s mother, the possibility of never eating another cheeseburger—to name a few. The glitch in the plot came with a huge deficit in my personal experience. I love being by the ocean, standing at its edge, smelling the brine. After more than one encounter with rip tide, I do not go in the ocean and have no understanding of scuba diving. The closest I’ve gotten to it was watching Sea Hunt as a kid. Help, I’m drowning in a literary sense. “Go to an expert,” my brain hysterically screams. Enter Ali, Alistair Dunnett, scuba diver dude. Ten minutes into a discussion with Ali uncovers my ignorance and saves me from writer ignominy and every scribbler’s horror: The Honking Huge Mistake In Print. While Ali patiently answers questions, one of the main action portions of my plot plummets to a horrible death. Diving won’t work, is totally out of the question, but in the next breath, Ali, herein to be known as SDD, supplies my feeble dues ex machina with an even better idea: Phil gets to watch her fiancé via a ROV (Remotely Operated Vehicle) camera when he gets sucked over the edge of the Marianas Trench. Oh, yeah, the brain is flying now, boys and girls. Give Phil some bad guy’s head to crack, piece o’cake, but freaks when she’s forced to watch her guy disappear from the viewer into the deepest underwater hole on earth. What’s she going to do to fix this? Don’t know. Haven’t gotten there yet, but will. So thanks to SDD, I (hopefully) won’t be humiliating myself in print and have been given an idea for a fantastic action sequence. 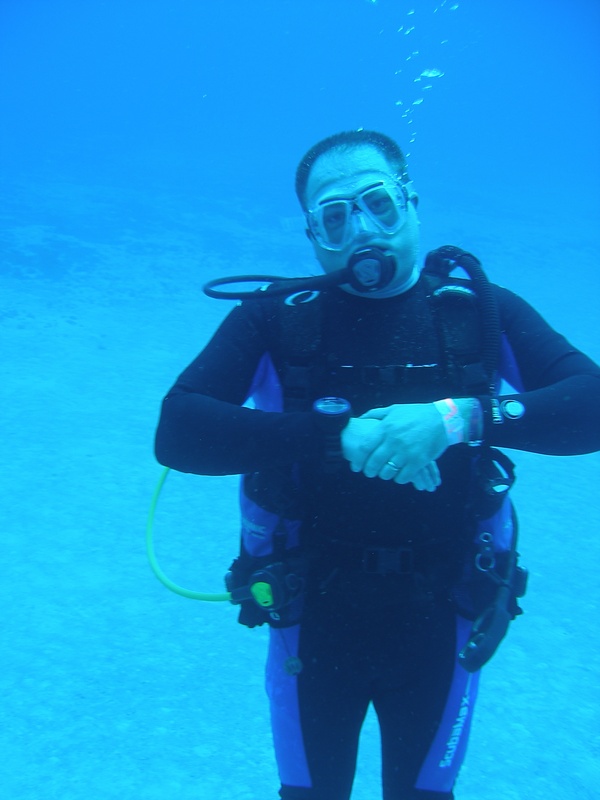 See photo of my hero, a la scuba in Cozumel.